The new 118-room hotel at Washington Square is open. 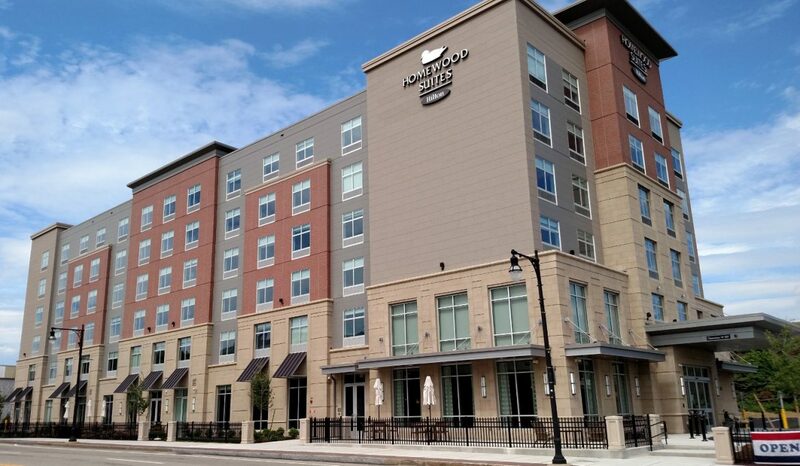 The Homewood Suites in Washington Square, Worcester’s newest hotel, has officially opened. With 118 suites, the hotel offers upscale accommodations in the heart of downtown. “As a hub for scientific and technical research, Worcester is known to be a city that hosts conventions and conferences, and that boasts strong higher education and medical sectors. We’re excited to offer guests a hotel that accommodates either one night of traveling or an extended-stay visit for business or leisure purposes,” said Ryan Hanratty, hotel general manager. Developed and owned by First Bristol Corp., Homewood Suites by Hilton Worcester offers a combination of studio and one-bedroom accommodations, featuring fully equipped kitchens and separate living and sleeping areas. Guests are also provided all the essentials needed for a smart, reliable and convenient stay, including complimentary daily full-hot breakfast, evening social Mondays through Thursdays, Wi-Fi and a grocery shopping service. Homewood Suites by Hilton Worcester also makes it easy for travelers to unwind with an outdoor grill area, fitness center and indoor pool. The property offers flexible space that is ideal for meetings and social events. For more information or to make a reservation, call 508-755-1234. To prevent harmful algal blooms at Indian Lake, the city’s Department of Public Works & Parks will apply aluminate sulfate (alum) on Tuesday, June 27. People are asked to avoid the water, discontinue boat use and fishing, and keep an eye on pets that day. The water will be safe to enter on Wednesday. According to the city, alum is a safe and effective way to prevent algal blooms by removing phosphorous from the water. The application is coordinated with the Indian Lake Watershed Association and has been approved by the Worcester Conservation Commission. Advocates, a provider of services to individuals facing life challenges, has appointed Karen Williams to vice president of Developmental and Brain Injury Services. Williams, a Worcester resident, comes to Framingham-based Advocates with more than 25 years of experience as a health and human services professional. Williams will be responsible for the overall leadership and administration of the Developmental Services and Brain Injury divisions. Williams oversees cross-functional services and systems to enhance the continuum of supports offered throughout Advocates. Williams has extensive experience developing and directing programs and clinical services for people with disabilities and behavioral health needs. 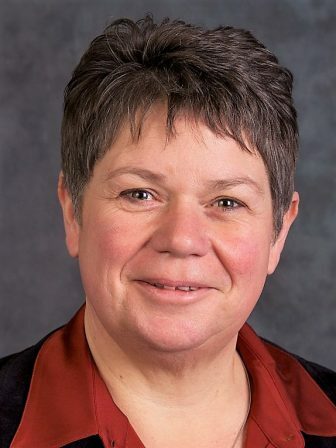 Prior to joining Advocates, she served as the senior director for disability and community services at the University of Massachusetts Medical School. She also previously served as program administrator at Worcester’s Kennedy-Donovan Center, overseeing home and community-based services. Williams earned a master’s degree in social work from Boston University. She also holds a bachelor’s degree in recreation and parks management, with a concentration in therapeutic recreation and special populations, from California State University at Chico. In an effort to increase access to public transit for the city’s youth, the city of Worcester and Worcester Regional Transit Authority have partnered to develop the Worcester Youth Pass Program, called “The W”. “The W” will pilot this summer with an eight-week pass running June 26-Aug. 19 that will allow unlimited rides to registered participants. The pass is valid from 9 a.m.-9 p.m. Mondays-Fridays for ages 8 to 24. The Worcester Division of Youth Opportunities will be managing the initiative and work with the WRTA on this pilot program. 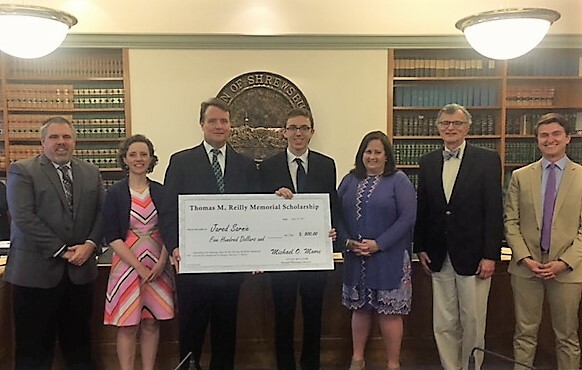 State Sen. Michael O. Moore, D-Millbury, recently attended the Shrewsbury School Committee meeting to present Jared Sarnie with the $500 scholarship named in memory of longtime Millbury-Sutton Chronicle columnist Tom Reilly, who passed away earlier this year. From left, Jon Wensky, Erin Canzano, Sen. Michael Moore, Jared Sarnie, Sandra Fryc, B. Dale Magee and Jason Palitsch. Moore sponsored the scholarship opportunity for graduating high school seniors who reside in the Second Worcester District. Sarnie, a recent graduate of Shrewsbury High School, submitted an essay that discussed budgetary cuts to the school district and their impact on theater department programs. While he is not a member of the theater department, Sarnie wrote an essay that highlighted the importance of being an engaged member of the community as opposed to being a bystander when issues impact those around you. The essay also highlighted the importance of involving partners and stakeholders to help solve a problem. “I appreciate Jared’s thoughtful reflection and recommendations about how to address an issue that impacts his peers,” Moore said.